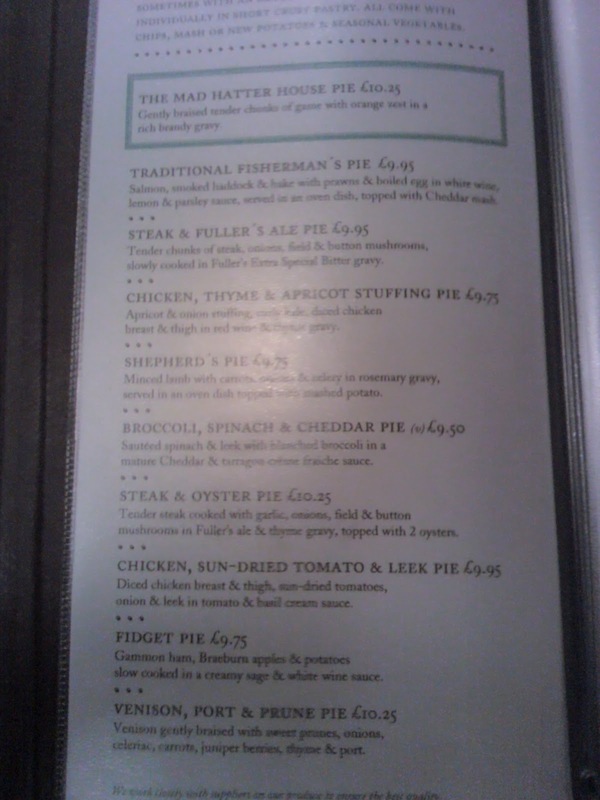 With some pubs you are happy to see one or two pies on the menu so when there is a choice of nine, it is like walking into a pie wonderland. 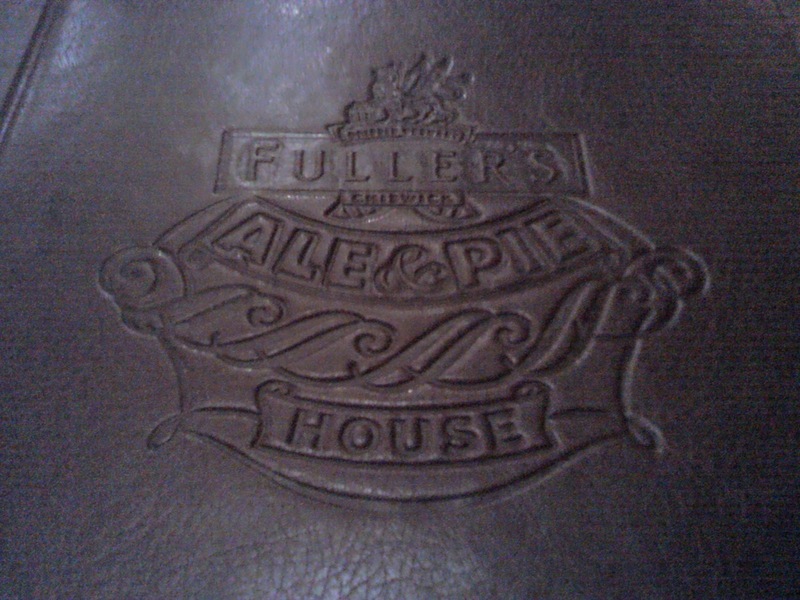 This is what happened when the Pierateers visited The Mad Hatter pub in Southwark, London. 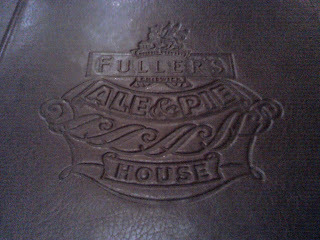 This is another Fuller's Ale & Pie House like The Jack Horner visited recently. The Mad Hatter House Pie - Chunks of game with an orange zest in a brandy gravy. The Pierateers were pleased that while the orange zest was very much part of the flavour of this pie it was not overpowering. The balance was good however we felt the game was slightly on the Chewy side. 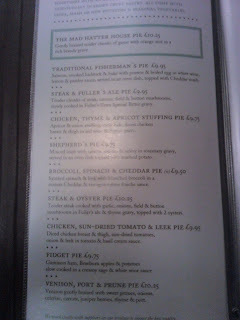 TJP described this pie as 'insipid' however it was noted that it was 'healthy considering the genre'. It must have done something right though as RAS described it as 'not too bad' and he is known for his carnivorous nature. 'Where's the ale?' were amongst the comments from the Pierateers. The meat was noted as a bit Chewy and the Content lacking, although to be fair this was a very small pie. However special mention was reserved for the mushrooms. The decision overall was that this pie was decidedly 'nothing special'. The comments for this pie focused on the lack of meat. The pie just tasted of onion and stuffing to some of the Pierateers, however the scores show this wasn't necessarily considered to be too bad. The Pierateers were undecided whether they would choose to eat the whole large pie in this flavour. Strangely this was the only mini pie not also available as a full size pie. SJL complained that he had no apple. TJP said that he had all the apple. TJP and RAS liked the gammon but controversially there is quite a divergence on scores for this pie. SJL said 'I was very disappointed, it just tasted of potato'. As this flavour sounded very different and intriguing the Pierateers decided to choose this as the full sized pie. However, it has been said by some that this was the biggest disappointment of their pie eating career. 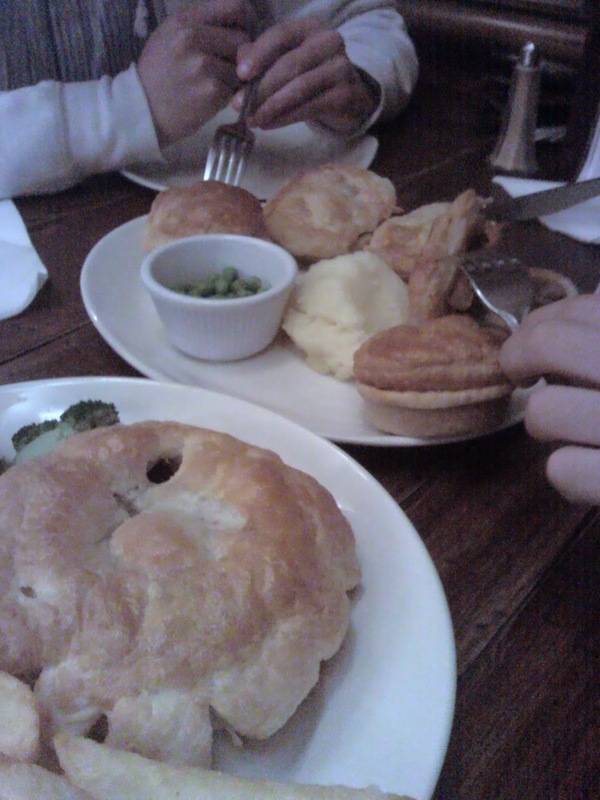 Two out of three Pierateers failed to finish their small share of the pie as they felt 'it was only just edible'. There was however one good comment from SJL that the venison was 'melt in the mouth' but the 'bizarre flavours' let it down. The use of juniper berries was particularly questioned. So there you go, while it was a disastrous end with, in our view, one of the worst pies ever eaten by the Pierateers, the pie platter scores quite high on average.